It’s Passover and that means matzo ball soup. I have not had matzo balls in ages. It’s one thing I wasn’t motivated to veganize, until now. I was inspired by Nava Atlas’ Vegan Holiday Kitchen when I had a chance to interview her last year (Listen to the interview here). I made some slight modifications to her Simple Vegetable Soup with Vegan Matzo Balls. Her recipe uses matzo meal and quinoa flakes with a gluten-free option to use all quinoa flakes and it’s delicious. Not having quinoa flour I decided to make them with brown rice flour. And the results? YUM! Quinoa flakes will make a lighter version, the rice flour balls are heavy. In a large stockpot, heat the 1/4 cup olive oil. Add the onions and celery and saute until transparent. Add the potatoes, carrots, dill and water. Reduce heat, cover and cook for another 20 minutes until the potatoes and carrots are tender. Add salt to taste. The soup can be eaten right away but is best to wait several hours or even a day later to allow the flavor to develop. In a large mixing bowl, add half of the rice flour. Mix in the onion powder and salt. Pour the boiling water in and mix well and let the mixture rest for several minutes. Add in the remaining flour and the oil and mix well. Cover and put in the refrigerator for at least 15 minutes. Line two large baking sheets with parchment paper. Preheat the oven to 275F. Remove the bowl from the refrigerator. It’s helpful to keep a small bowl of rice flour nearby. Lightly dust your hands with the flour. The mixture is soft and slightly sticky. Roll into 1 – 2 inch balls and place on the lined baking sheet. Repeat until all the batter is used up. Place the baking sheets in the oven and bake for 12 minutes. Carefully turn the matzo balls over and cook for another 12 minutes. Remove and allow to cool. When ready to serve, reheat the matzo balls on a baking sheet in a 200F oven. Heat the soup. 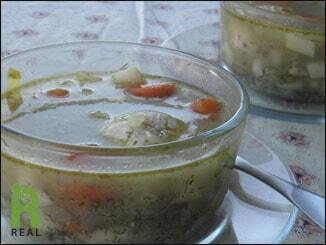 Place several matzo balls in each soup dish and cover with soup.